OTTAWA-International film star Jackie Chan’s daughter Etta Ng Chok Lam on Monday confirmed that she had married her 31-year-old Canadian internet celebrity girlfriend Andi Autumn. 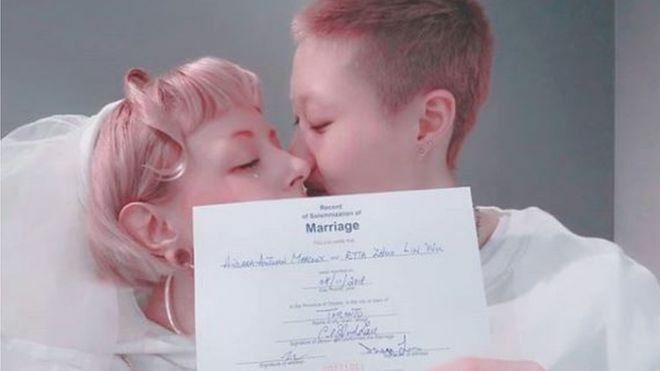 Chok Lam 19, posted a photo of her with her girlfriend on her Instagram account, both wearing white dresses and holding a marriage certificate dated November 8, 2018, captioned “united by love and law, on our wedding day”. “We have all been hurt but if you can dream of love, you can find it. Love is kind, it does not judge. Love is both strength and weakness. Love can make a change. Love wins!” she wrote. Chok Lam is a daughter to Jackie Chan and actress former beauty queen Elaine Ng Yi Lei though the two did not marry. It is said that Chok Lam and Autumn started dating in 2017 and the two moved to Canada in October that year, but their relationship failed to win support from her parents. In April, Chok Lam asked for help from the public in a YouTube video that went viral. In the video, she said that she and Autumn were on the verge of homelessness, and blamed her “homophobic” parents which claims were denounced by her mother Elaine Ng.